The professional challenge of "Levelling-up" as part ofour commitment for continuous improvement of delivery of products and services is the battlecry for us at PSA. At this time, the PSA resources and talents were channeled for successful ISO accreditation, a dream shared by the Provincial Statistical Office of Catanduanes as we remain steadfast to our vision of a solid, responsive, world-class public service provider. In gearing-up towards that vision, the office is cognizant of the important roles played by the hard-working men and women of PSA Catanduanes. Our recognition as the 13th best among the 81 provinces in the country during the 2017 PSA Awards is a testament of our laudable efforts at work. Indeed, none went unnoticed and it is our desire to thread the same path of distinction and adopt work values emphasizing the importance of quality and continuous improvement. We are grateful to the support given by the PSA Management throughout our fruitful journey. 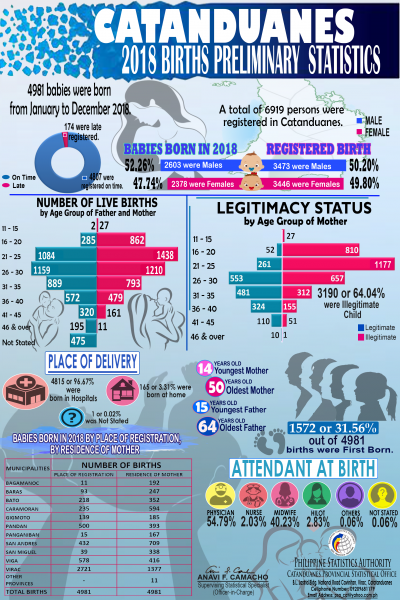 We also express our deep gratitude to our partners and stakeholders and the many respondents of our different censuses and surveys. Our collaborative culture has made a difference! Dios mabalos. Lying east of Bicol mainland, Catanduanes is an island paradise in the pacific, covering a total land area of 1,511.5 sq km. Your visit to this island is more than just wxploring its unspoiled beaches or enjoying surfing at Puraran Beach located on the northside. Catanduanes offers much more. It is rich in history, belnding quality with the peaceful jutting mountains all over the island. Adventurers hike the twisting trails of Gigmoto and San Andres and enjoy the cool refreshing waterfalls. The religious visit to the ancient church of Bato and hike to the stone chapel a kilometer away where the first mass was believed to have been celebrated byt the Spanish conquerors. Island life is not quite as it seems. The capital town of Virac is irresistible for an oceanfront entertainment and arousing videoke bars. A hotel offers a breathtaking view of the entire island as its penthouse restaurant. Resorts abound to accomodate leisure-sseking travelers, with a chain of picnic sheds and cottages over a well-manicured, surrounded with lush greeneries. The province comprises Catanduanes Island (also called Virac Island), the Panay Island, Lete Island, Palumbanes group of islands (Porongpong, Tignob and Calabagio) and a few other minor surrounding islets and rocks. 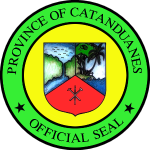 Catanduanes was a former sub-province of Ambos Camarines in the early 1900s and later of Albay. It gained provincial autonomy when Congressman Francisco Perfecto filled House Bill No. 301 which separated the province from Albay. It was approved on September 26, 1945 and subsequently signed into law by President Sergio Osmeña on October 24, 1945. Remigio Socito, the last Lieutenant Governor, was appointed as the first Provincial Governor. When elections were held in 1947, Alfonso V. Usero became the first elected Governor. The Philippine Statistics Authority (PSA) Catanduanes will undertake the October 2017 Consumer Expectations Survey (CES).